Good morning everyone! I am one Newport Beach Wedding Photographer that’s still recovering from a super awesome weekend shooting Martita & Miguel’s Placentia Wedding, Adrienne & Matt’s Engagement Shoot at the Fullerton Arboretum, Nicole & Mark’s Engagement Shoot at Union Station in downtown Los Angeles and the Archibald Family Portraits on the beach at the Montage in Laguna Beach (WHEW!). Continuing on with the all time best music videos from the inception of MTV back in 1981 to current. We’re up a year in the way back machine to 1982 for this week’s West Coast Wednesday Video Of The Week. Michael Jackson released his second adult solo album; Thriller, Graceland; the hope of Elvis Presley opened to the public (which is a must see at least once in your life!) and some of the popular films were E.T. the Extra-Terrestrial, An Officer and a Gentleman, Poltergeist, Chariots of Fire and Gandhi. This week’s band takes us wayyyyyyyy back to 1982 and note only are they now celebrating their third decade performing, but they’re one of my favourite bands of the 80′s too. The group is the Go-Go’s and if you’re not too familiar with those awesome ladies, check out some of their Bio from their website, it’s awesome! “From their halcyon days as America’s sweethearts to their current status as superstars who pioneered a genre, The Go-Go’s preside over an amazing three-decade reign as high pop priestesses. The internationally-loved pop hitmakers helped cement the foundation of the early 80′s pop-rock sound without the aid of outside composers, session players or, most importantly, creative compromise. 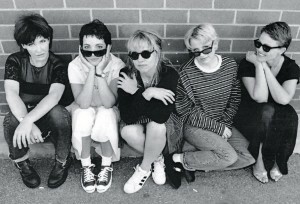 From their very first show, The Go-Go’s sang and played their own songs, offering five feisty role models for a generation of ready-to-rock girls and good, hooky fun for pop-loving guys. So! Before you check out this week’s West Coast Wednesday Video Of The Week and you’re thinking… Hey – I’d really like to get to know this Newport Beach Wedding Photographer (Previously a Huntington Beach Wedding Photographer) that loves 80′s music & fashion, photography and art, feel free to contact me anytime. So without further ado, I give you the Go-Go’s with one of my favourite songs and their 1982 hit; “Our Lips Are Sealed” from Newport Beach for today’s West Coast Wednesday Video Of The Week. Plus! If you’re from the Orange County or Los Angeles area, you’ll recognize quite a few locations and what’s really interesting is some of the shops and places that are in the video are still around today. That is so totally rare and cool! So feel free to sit back with your favourite morning beverage (I’ve got my coffee Powerade Zero & Monster Zero! ), enjoy Belinda Carlisle’s infectious vocals and Jane Wiedlin’s cuteness of the 80′s and kick off your West Coast Wednesday positively in Newport Beach, Huntington Beach or another part of this crazy world we’re all a part of. PS, Photo compliments of the Go-Go’s website. Love classic rock band black & whites!